Telangana state is located in the southern region of India. It was formed on 2nd June 2014. Telangana state is bordered with Maharashtra, Karnataka, Chhattisgarh & Andhra Pradesh states. Hyderabad is the capital city of this state. Telangana has many reputed colleges and universities which impart higher education in various fields of education. It has Indian Institute of Technology (IIT), National Institute of Technology (NIT) & many other top engineering colleges. The literacy rate of Telangana is 66.50%, as per the census 2011. 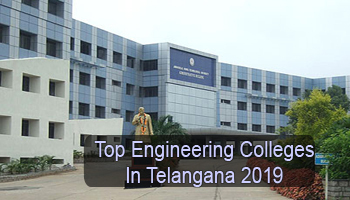 Here we are providing a list of Top Engineering Colleges in Telangana 2019. At Sarvgyan.com, we have created a list of top engineering colleges in Telangana for the academic session 2019-20. This list includes IIT Hyderabad, NIT Warangal & many other government & private colleges. In our list, we have rated the colleges and universities on the grounds of different factors which are important for quality education & better future prospects. We have rated the colleges on academic excellence, college affiliation & approval, quality of education, placement records, college infrastructure & facilities, student’s preferences, etc. Students seeking for admission in B.Tech courses can apply through TS EAMCET (state level exam) and JEE Main (national level exam). Admission in M.Tech courses will be done on the basis of GATE & TS PGECET scores. Birla Institute of Technology & Science organizes its separate entrance test (BITSAT) for providing admission in B.Tech, B.Pharma & other courses. Candidates can appear anyone from the above mentioned exams for admission in UG & PG engineering courses. Various colleges of Telangana offer a wide range of specializations in engineering courses. Some top specializations are Computer Science & Engineering, Electronics & Communication Engineering, Civil Engineering, Mechanical Engineering, Chemical Engineering and Electrical & Electronics Engineering. For any other queries about Top Engineering Colleges in Telangana 2019, you can ask us by leaving your queries below. can you publish the collages in rank wise? I want to know the Geethanjali collage at cheeryal village, keesara mandl, medchal dist. what is the ranking in 2018.